Dan Glover reckons his 1998 model Kenworth T401 which he bought last year is the right rig for the job. Dan Glover’s 1998 Kenworth T401 is used for hauling produce. Dan Glover is one of the recent influxes of people to join the ranks of becoming an owner-driver. So what better way to start than behind the wheel of a 1998 Kenworth T401. "Owner-drivers are somewhat of a dying breed, but I wanted to give it a go and see if I can make it," says Dan says, who is based at Longford in Victoria. "It’s been pretty hard starting from scratch looking for ways of work." "I bought the truck myself, along with a flattop, and there was no family business to pick up from," he says. Dan bought his Kenworth T401 from the Gippsland Truck Centre September last year. 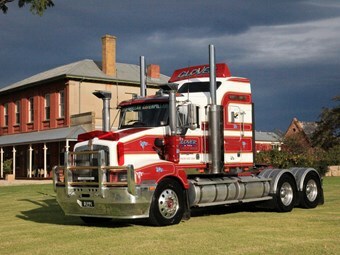 The Kenworth originally came from Bairnsdale where it had been owned by RDB Transport since new. "It’s a one-owner truck and had done 3 million kilometres over 16 years pulling a single. It hauled potatoes up to Bundaberg most of its life," he says. "It had been a good truck for them, and the maintenance history was excellent. "They recently upgraded the suspension to Airglide 400 and so far the 445hp [327kW] C12 Cat is doing a good job. "They are a good reliable low cost engine for what they put out," Dan says. The Kenworth has an integrated bunk so there is plenty of room if Dan decides to run interstate. However, at this stage he prefers to stick with local runs. "When I first got the truck, I eased into it carting livestock on local as a subcontractor for a couple of months. "Now for the past eight months I have been pulling a drop deck tautliner for Covino’s farms and have recently bought my own refrigerated van, enabling me to specialise in dock work and cold stores." For more on Dan Glover and his Kenworth T401, see the August 2014 edition of Owner//Driver.